May i know can the above cards use for bus,JR train, subway, Kintetsu and convenient store in Kansai area? Those both IC cards also works in "ICOCA" and "PiTaPa" cards area in Kansai. So you can use it for railways, buses and only ICOCA member shops service. and shopping at convenience stores, also use at restaurants etc as "e-money". PiTaPa is private rail (non-JR) and bus companies group network. But both cards can not be used for shopping at PiTaPa member stores. - Return the card for deposite and charge back. If you can use "non-registed" card that anyone can use, only return the card. It will not be necessary to explain that Suica and PASMO can not purchase in Kansai area. or it would be easier if you do re-charge (20,000Y max) in advance. it means you should find "1 day pass" or similar ones. Do you mean that vending machine at train station can't top up the Suica and Pasmo card? Top up only can be done in convenience store such as 7-11 and Lawson? Any other convenience store and place in Kansai can do the top up value? As we have existing Suica and Pasmo, hence we do not want to buy ICOCA. 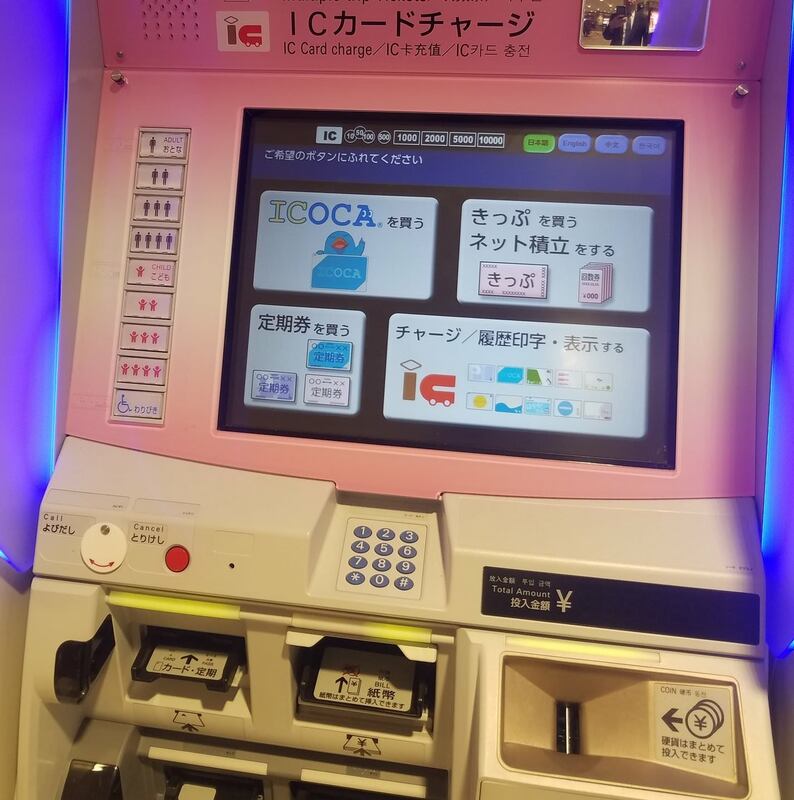 You can top up Suica at any station using ticket machine also in kansai area as Icoca. Do you mean that vending machine at train station can't top up the Suica and Pasmo card? Nobody said that. Yes, you can top up at ticket machines in the Icoca and Pitapa areas. You can not re-charge in a small unstaffed stn where only card reader is placed like this photo. However, the benefits of using an IC card(Suica,PASMO and more) are basically two. other one is to avoid having to buy paper tickets every time at stn ticket vending machine. and crowded at the nearest stn of famous sightseeing spots such as Kyoto is usual. so it is easier to re-charge at convenience store that you find soon. where the entrance to the stn is, especially the subway underground stn, right? but the lang switching button on the upper right is hard to see with reflection of lights. but it is possible to find out immediately only famous big 3, 7-11, FamilyMart, and LAWSON. but most of the stores were absorbed by FamilyMart in last summer. but these three companies manage about 60,000 stores. however, it does not have any problem if it only goes around the famous tourist spot in Kyoto city and around.